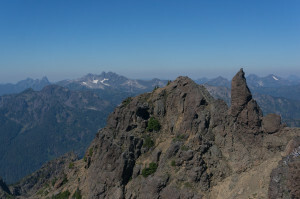 The Brothers, a.k.a “The Little Lords Fauntleroy” (no, seriously), are a twin summit prominent from Greater Seattle to the east. Like most eastern Olympic peaks, they are mostly steep choss-piles. Both they and the nearby Lena Lake are extremely popular destinations, especially near a holiday weekend. From the crowded trailhead, I followed the switchbacked trail up toward Lena Lake. While the switchbacks’ horrid flatness is not obvious on the way up, it is maddening on the way down, where the flat trail is also frequently too rough to be runnable. The ongoing shortcut war between them confirms that I was not the only one annoyed. The trail eventually reaches the (now dry) stream leading from lower Lena Lake, which it follows to the lake itself. 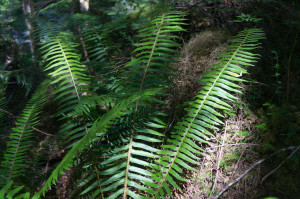 The area is heavily developed, with many established campsites, a multi-hole composting toilet, and numerous signs informing campers about the dos and don’ts of wilderness living. 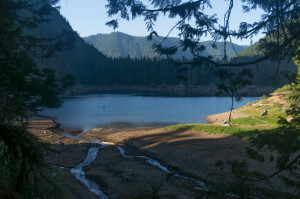 The trail splits above the lake, with one branch leading to more camping at upper Lena Lake, the other to the Brothers. 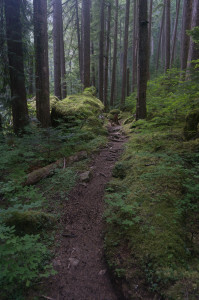 The latter branch follows another stream (also dry) through the Valley of Silent Men, an area of especially big trees and lush moss, eventually reaching a popular climber camp in a relatively flat area of moss and decaying logs. This section was especially pleasant, with a well-established trail passing through shady and open forest. Above the camp, the trail climbs more steeply along a creek, then leaves the water to cross a burned area on the way to the scree-chute. The open south-facing slope was already hot, but the burned area is perfect salmonberry habitat, i.e. a gauntlet of free food. 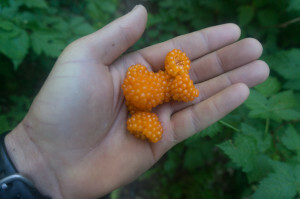 One could often gather a small handful of the juicy, tangy orange berries from a single spot. Above the berries, I followed cairns and bits of trail through the ravine, then along the left-hand side. Seeking shade and less scree, I eventually headed straight up the bottom of the ravine, getting myself into a bit of unnecessary 4th class near some steps before exiting to the right and returning to the cairned route. This upper portion is normally a moderate snow climb, but in this exceptionally dry year the route was entirely snow-free and scree-full. The summit flies were even more vicious than the day before, so I rested a safe distance away in a small shady spot before returning. I followed the trail and cairns more faithfully on the way down, and generally had a better time, even scree-skiing a few bits. Still, I would only recommend the Brothers as a snow climb; perhaps this is what it is/was in July of a normal year, but this year May might have been better. Passing through the fruit stand again, I met a lone shirtless Aussie in running shorts and a hydration vest. Though he looked like he was speed-running the peak, I soon passed his overnight gear, including a giant can of Fosters. 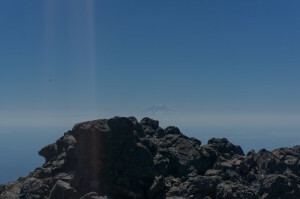 If I were him, I probably would have waited to summit in cooler conditions the next morning, but to each his own. The hordes were truly arriving as I passed Lena Lake on the Friday before the Fourth: families, dogs, even kids with pool noodles. I’m all for wholesome family fun, and for teaching kids about type II fun (i.e. that some fun should hurt) before they’re old enough to think for themselves, but it wasn’t really my scene. Many switchbacks later, made worse by my headphones’ total death, I was back at the trailhead by mid-afternoon. With time to kill, I headed back south to Hoodsport for some internet and the nearest likely source of headphones. Passing a solid stream of RVs, I turned off into the library parking lot to find it closed, with a fundraising book sale going on outside. Not wanting to get in the way, I pulled in front, put up my shade, and flipped open my laptop to catch up with the world outside. I was just about done, and ready to start the headphone hunt, when one of the women from the book sale came over to ask if I wanted a hot dog. I’m not one to refuse free food, so I headed on over and was even guilted into buying a soda — their fundraising ploy worked. I talked with the two older women for awhile, finding out a bit about the local economy (declining timber and not much else), and learning how I was mis-pronouncing odd local place names like Sequim and Dosewallips. I also learned from Jenny, the younger woman who had offered me the hot dog, that the area had good scuba diving, with territorial octopi and non-biting sharks. When I asked about headphones, she gave me her old pair which, while not exactly in line with my normal drab fashion sense, are functional and perversely enjoyable to wear. Shopping complete, I headed back north, then up the Dosewallips River road to the impromptu trailhead at the washout forming its new end. The “trailhead” was serving double duty as a party spot, so I parked what I thought was a safe distance from the revelry to sit and read. My distance proved less safe than I thought: a large truck with two likely impaired guys in it backed the road past me with windows down and music blasting. Just past me, it headed into the grass (“Dude, you’re off the road!”), getting stuck entirely in the ditch. Driving forward onto the road just spun the tires, and a backward attempt soon ended at a tree (“Whoa, tree! !” thud). This entry was posted in Tourism, Washington. Bookmark the permalink.